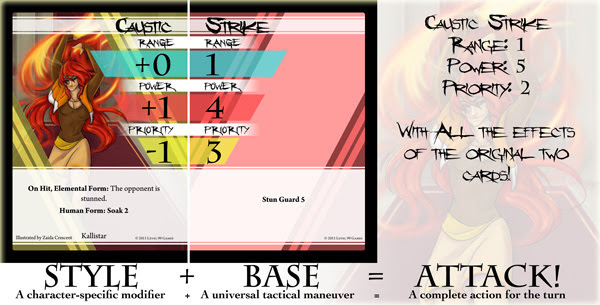 At its core BattleCON is about choosing a fighter (with unique abilities and cards) and going head to head with an opponent. In your hand you have two kinds of cards. In every turn of the game both players chose one of each kind and then reveal them simultaneously. The cards are then executed after a set of rules that are slightly complicated at first, but after a couple of games they become second nature. The cards you just played are then put aside and out of your hand for two turns. In that way you always have two sets of cards that you can’t choose from. Knowing how to set yourself up for cool moves in future turns is a big part of the game. You continue to do this until someone is dead or a set amount of rounds. And that is basically the game. What is so interesting about the game is how a match evolves, how you try to take into account what cards your opponent have available, what their strategy is, what the strengths and weaknesses of their character is and so forth. It is deeply strategical and incredibly rewarding. 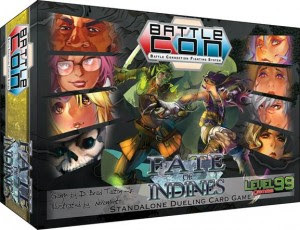 BattleCON: Fate of Indines is the latest base set available in the lineup of BattleCON games. There are three base sets (War of Indines, Devistation of Indines and Fate of Indines) and a lot of smaller boxes that gives you extra stuff to do. There are no overlap in fighters between the base games, so in that sense either one is good, however there is A LOT of stuff to dive in to. If you just want to get your feet wet and try out the game Fate of Indines is the perfect place to start. It also has a perfect box size to carry the game around. I love this game. The amount depth in such a simple concept. The well-balanced fighters. The thrill of out-thinking your opponent. The ease of the game. It can be explained in less than five minutes, but have so much room for strategy and bluffing and getting into the head of your opponent. The complete lack of luck. This is the best possible fighting game system I can imagine. Fate of Indines furthermore is the perfect entry for newcomers. It is small enough to not be overwhelming while still offering enough fighter variability to really let players get into the game and the size of the box is perfect for carrying it around. I almost always have it in my bag ready to get in a quick game with a friend. This game is fun in a box. If you at all like games of strategy in a “one on one” environment this is one to try. The theme and the directness of the conflict might turn some away, but for me it is perfect. This game completely encapsulates the feel of the 2D fighting games (but at a much slower speed – thankfully). And if you get more of the base games you will also have a “beat ’em up” game in a box as well as tag team play and many more awesome play modes. The care and thoughts going in to these packages is incredible and nothing feels unthematic. The game can really be played on anything that constitutes a row of boxes, and as such doesn’t require much, however the game board that comes with Fate of Indines is a little bland. I personally have bought some nice neoprene gaming mats for when I need to show of the game. It just injects it with a lot more visual spectacle. The fighters on the other hand have awesome art on them and I have nothing to say against that nor the cards in the game. The overall quality of the production is incredible. The only nicks I have against it is that there were a few places in the manual that took me a while to really understand and some of the wheels you use to keep track of your life are a bit loose (but honestly I don’t remember which of all the BattleCON boxes they came from). There is also a small printing error in the first printing that I received. This is a simple game. If you have it explained to you it is an easy level two complexity game. If you have to learn it from the rules it sneaks into the level three area but just barely.